Mom's cousin Mila stands up to greet us. Where have you been, I've been worried, she says and my Mom looks guilty. The two of them fall quickly deeply into a conversation and I take these pictures for you. I'm in a sofa, set apart from them. There's no need for me here, I think I'll go check my mascara and leave them alone for a few minutes. I whisper to my Mom that I'll be back. I go upstairs and play with my hair some and fix my lipgloss. Really I have nothing to do up here but I wanted to let them talk, they looked so serious. had a feeling what it was about and I wanted to step outside of that conversation, but after three minutes in the hotel room I knew I was hiding from it, leaving my Mom alone. I pushed the elevator door to take me to the first floor, then remembered to take the stairs. I raced down and arrived before the elevator doors opened. Score. 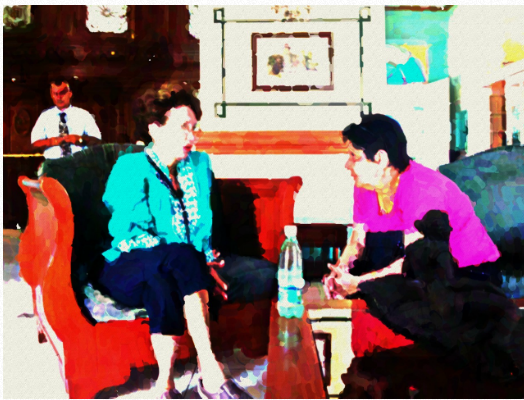 Mom and Mila were still sitting there in the hotel lobby still in a serious talk. I'm not sure who the guy is, but considering that later that night I'll have a huge revelation about being stalked, I wonder why he was standing there, listening. I take this picture, breaking every rule of polite society regarding when pictures should be taken, then politely interrupt. Can I have some of that water? Right there between you two? They say yes then I offer, or WAIT can we go outside, by the pool and talk there? Heads nod. We go out there and sit at a table in the shade, right next to the bar, facing the gorgeous empty pool that is guarded by statues of lions. Mom and Mila fall back into their conversation and I look around. Over there is a man with plaid shorts and no shirt, reading a thick book in English. I'm very aware of wearing a long sleeved shirt and long jeans. My daughter always tells me I wear burqas and right now I feel like a nun. No part of me would feel right in a bathing suit, just swimming in a pool in Cuba like that's a normal and OK things to do. The waiter comes by and we order wine, white wine, and Mila orders a coke. She's very serious and we are on vacation. Before the wine arrives Mom tells me in English that Mila wants to come to the US. I knew this, I understood their conversation, but I only nod, tight lipped. The wine arrives, along with the cola for Mila. One sip, two sips, small talk. Then Mom asks me in English and repeats herself in Spanish, "What do you think?" I nod, sip sip. Maybe there is magic in this wine, maybe it will help me not say what I'm thinking, because what I'm thinking sounds like Rush Limbaugh. I answer that I think it would be a lot of money -- thousands of dollars -- and that money would be better spent, here. Mom translates. Mila answers by shaking her finger and saying she wants to come and work. Sip, sip, sip, almost finishing the wine. I ask her what it is she plans to do. Clean houses, she offers and no, sip sip sip, I finish my tiny glass and say in Spanish then English so my Mom can say it again in 'good Spanish" that she can't come to the US and just work. There are people far ahead of you who speak English, who drive, who are just more familiar with the US. Also, she can't stay with me, she can't stay with mom, she can't stay in Abuelo's new place, so we weren't sure where she intended to stay. Again, this isn't who I want to be. But also, this isn't someone trying to flee a revolution, violence, civil war. The pressure to make difficult decisions between helping close family and distant family just isn't "there." She scowls a little bit. I scowl too, because I can't believe this is coming out of me. I swear to you I think in my heart this is the best country EVERRRRR and this country should be open to refugees and immigrants, that new Americans are some of the most productive economic engines. But no. When faced with an actual person who wants to actually come the US I might as well be wearing Sarah Palin's red pumps. I'm against it, 100%, deflecting her optimism like a bully stomping on cupcakes. Mom listens and listens to Mila's plans and I interject clarifications. Where does she think she would stay? How would she get THERE from there? Things like that. Mila asks if she should call her daughter to join us for the evening and I shrug. 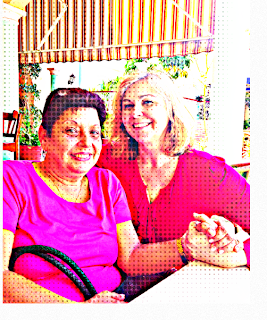 I know my time with Cuban relatives is new and precious but I really really want more time with my Mom. Mila has no choice but to accept that. After spending the better part of two hours telling her that she had no place to stay in the US, that she would be lost and confused in the US, we also told her if she just wanted to come for a small vacation, maybe we could swing that. This was the wine talking. And love. Love of family and love of country together - how could we, more American than Cuban, keep the awesome US from her? Mila pretends to be happy but I think she hoped for a different answer. In my heart and soul I genuinely thought I'd be a person who gave a different answer, who was more like Jimmy Carter giving his speech where he welcomed Cubans "with open hearts and open arms" in 1980. Oh well. After three glasses of wine Mom and I start to settle the bill and discuss what we will be doing next. I suddenly want to watch the sunset on water, I *need* to see the sunset on water, and she agrees that would be the perfect ending to our day. As we are waiting for our bill, Yamila re-appears. I thank her again for my earrings (I'm still wearing them as I write this). She giggles and I remember I promised her a book, so I leave them and race back up to our room. 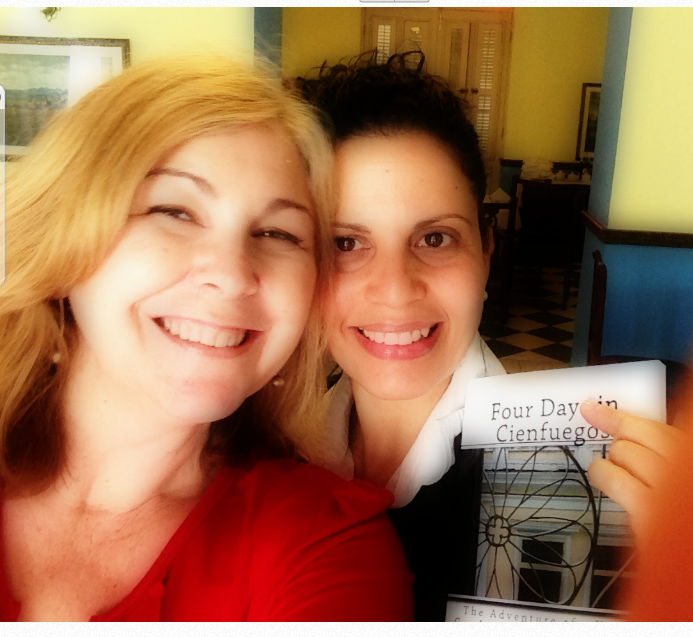 I grab two copies of "Four Days in Cienfuegos" and carry them down the stairs with me. Before meeting up with everyone I put one book on the kiosk in the front of the hotel. This is the same kiosk where I realized the Russians spelled Cuba "KYBA" and thus caused Cubans to suddenly interject the letter "Y" into names, marking a generation of Yaisy's and Yasser's and Yamila's and Nateley's. You get the picture. I take a picture of my book there, surrounded by communist-approved literature. Then I sign a book for Yamila and take a picture with her. After that Mom and I say goodbye to Yamila then say a much more awkward goodbye to Mila. We silently agree we want to help her, and also agree, equally silently, that coming to the US isn't the answer to everything that is wrong in Cuba. She goes home and we go off into the street to flag down a Cubataxi to take us to the water, to the sunset, to where I'm called to be.